Although we were upgraded at no cost to an apartment, the overall experience was pretty awful. The Restaurant should be renamed the canteen, and the entertainment centre, (particularly centre stage) was sticky to the touch, that includes table tops the bar tops and the carpets. Some bleach and Mr Muscle needed urgently. What can I say, just come back from Butlins, and never had a worst experience. Lets start with the cleanliness, the toilet had a spider squashed on the seat, the bath had live and dead insects(spiders,ants and flys)in it, the bed covers looked dirty, the pillows had some dark black stuff over them. The food(if thats what you can call it), gave 3 out of 4 of us food poisoning, and it pretty hard to tell what food it was, i did have to ask on the first night. When we got back after the dinner, outside our apartment, we had a bin back ripped outside, to which it took over 12 hours, to be moved, and when it was the soiled nappies where left outside our room for a good 4 or 5 hours longer. on the plus point(the only one), the pool was really good. All in all, I will not be going to butlins, and prtty sure I can say that to the other 3 in our party. I love visiting Butlins. We have fun every time we go. The rooms are really clean and the food is delicious,you can eat as much as you like. Entertainment is great the redcoats are really talented and Butlins often have famous people there to take away an extra special memory of the holiday. The staff are really friendly, they are never sad they are always smiling and I would definietly return. I highly recommend to everyone. I went down to Minhead to run workshops for a conference, so technically speaking I wasn't a guest. 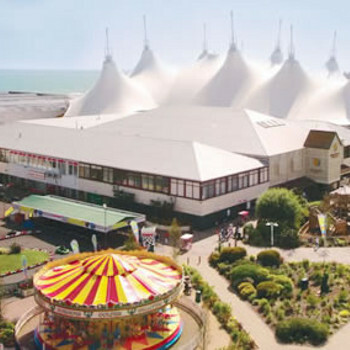 I've been working at the different Butlins venues for more than 10 years now, and IMO Butlins has improved immeasurably. Most of the chalets are now very clean and comfortable and more than adequately equipped. We stayed in the Silver Accomodation, it was basic, and very cramped.We stayed for four nights,the bin was emptied on two occasions, and the beds were made up just the once. We stayed in a deluxe apartment which was lovely. It had two bedrooms, 1 with a double bed, but the room was big enough to put another 2 beds in, and the other room had 2 single beds, again another big bedroom. The double room had a portable telly and a safe in it and in the lounge was a 3 piece suite, telly, video player and dvd player. We had a good sized bathroom with both a shower and a bath. There was no kitchen but we had a fridge, ironing board and iron and tea and coffee making facilities, which was fine as we were half board. The room was spotless and if you had a problem then there are always security and staff walking about, so we just went and spoke to them and the problem was fixed straight away. We found the food to be excellent. The breakfast's were full english breakfasts, cereal, fruit, toast and jam, fruit juice, tea and coffee. The evening meals were varied with lots to choose from. Proper 3 courses if you wanted to. Always piping hot and plenty of it.We found the staff to be friendly enough. The entertainment was good lasting to 2am. We went on an adult only weekend, so there was no kids about atall.There were several bands playing when we were there, the bars are always very busy and can get abit overcrowded. There are lots of other things going on during the day and night. The funfair, swimming pool with water shoots, crazy golf, bingo, amusement arcades and much more. A short walk takes you down to the baech or up into the town centre.We love it here and have been lots of times with and without the kids. A good place for a hen or stag weekend, birthdays or just a family break, but be warned you can end up spending lots and lots of money. It's cheaper to go abroad! But it's still great and a good laugh. Stayed in a silver apartment for a three night break. Apartment was clean and quite modern, the kitchen was very small and the rooms felt slightly damp if you didnt leave the heating on low. Used the new key care system to get in and out of the apartment, prefer this to the keys. The restaurants and cafes were fairly priced, as was the supermarket on site. All the staff except the redcoats seemed european, especially in the restaurants. Minehead itself is well worth a look, lots of shops and cafes, we also went on the steam train that departs from there. I cant believe what I have been reading ,what a fantastic place this is :rooms clean and lovely,food very good,entertainment 1st class, (Redcoats go out of their way to make the children have fun. On arrival the toilet didn't flush, had to repair it myself. The shower was full of damp and smelt very musky. The accommodation was basic and the furniture was the most uncomfortable ever. The pictures of the accommodation in the brochures and on the website bore no resemblance to what we were provided with. At 02.45am on the first morning after arrival we had endured the family above us moving furniture around for an hour and their children constantly running around and screaming. On attempting to make a complaint I was initially greeted by an eastern European rep, who basically could not speak English, I was then directed to the reception where the complaint was nothing more than recorded. They would not move us, saying there was no alternative accommodation available. The noise continued on the subsequent nights. The food provided in the restaurant was mostly cold and of poor quality. There were what looked like thousands of people all wanting to be fed at the same time, complete chaos. More like feeding time at a local zoo. Don't be deceived into thinking everything is included in your booking price. Only the swimming pool (with a 30p charge for the use of a locker),the entertainment and some parts of the fun fair were free. Everything, drinks, food, gifts and souvenirs were about 30% more expensive than normal. On the positive side the the Sun and Moon pub and the Irish bar are nice places to visit apart from the prices.